Univ Of Minnesota Press, 9780816649280, 336pp. Today India’s middle class numbers more than 250 million people and is growing rapidly. Public reports have focused mainly on the emerging group’s consumer potential, while global views of India’s new economy range from excitement about market prospects to anxieties over outsourcing of service sector jobs. Yet the consequences of India’s economic liberalization and the expansion of the middle class have transformed Indian culture and politics. In India’s New Middle Class, Leela Fernandes digs into the implications of this growth and uncovers—in the media, in electoral politics, and on the streets of urban neighborhoods—the complex politics of caste, religion, and gender that shape this rising population. Using rich ethnographic data, she reveals how the middle class represents the political construction of a social group and how it operates as a proponent of economic democratization. Delineating the tension between consumer culture and outsourcing, Fernandes also examines the roots of India’s middle class and its employment patterns, including shifting skill sets and labor market restructuring. 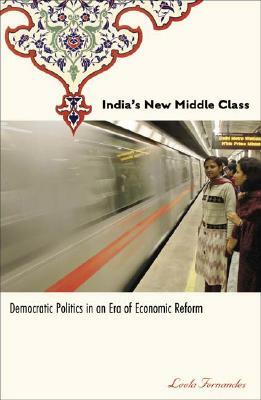 Through this close look at the country’s recent history and reforms, Fernandes develops an original theoretical approach to the nature of politics and class formation in an era of globalization.In this sophisticated analysis of the dynamics of an economic and political group in the making, Fernandes moves beyond reductionist images of India’s new middle class to bring to light the group’s social complexity and profound influence on politics in India and beyond.Leela Fernandes is associate professor of political science at Rutgers University, New Brunswick.